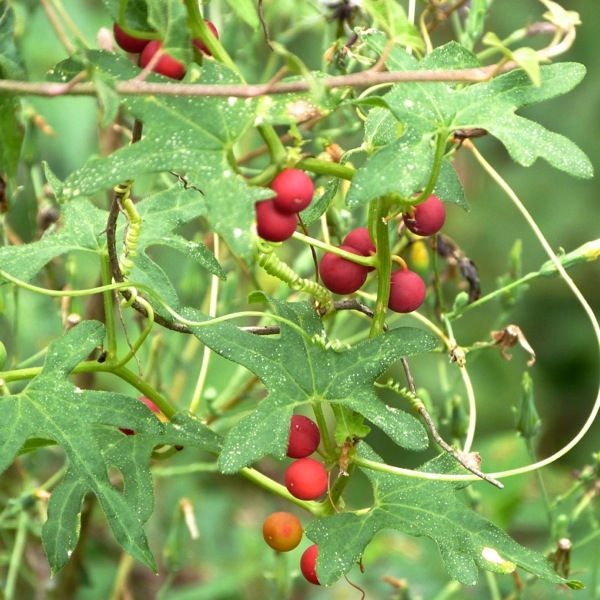 Bryony is one of those plants that twists and twines through the hedgerows in a fairly unobtrusive way, until autumn, when it suddenly blazes with bright red berries. I’m rather fond of it, not least because it was one of my favourite illustrations in a childhood book called Flower Fairies of the Autumn by Cicely Mary Barker. 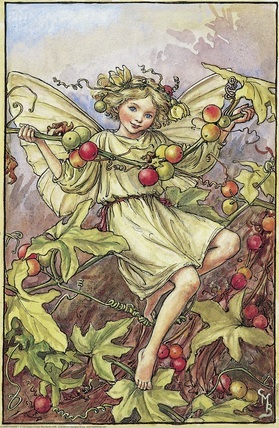 I found this image on the website of a company who sell prints of all the flower fairy illustrations – it’s worth heading over to their site to take a look. Some of the images are very beautiful, and they’re botanically accurate too. In fact, it’s largely thanks to the Flower Fairies series of books that I can recognise so many wild flowers. 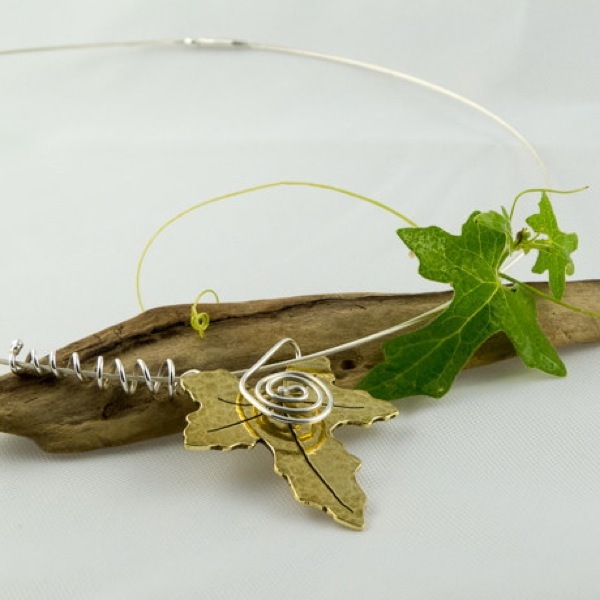 I knew that I wanted to create a necklace based on the bryony plant, because the leaves are such a lovley shape, and the curling tendrils that they use to clamber through the hedgerows offer interesting possibilities for forming twists with wire. I kept looking out for some for several days when we went on walks, with no success. I was beginnning to think I’d have to find some images online to work from, when David noticed that we had some growing at the far end of our garden, which just shows I’m clearly not as observant as I like to think! Here it is. I have created two necklaces based on the bryony so far. 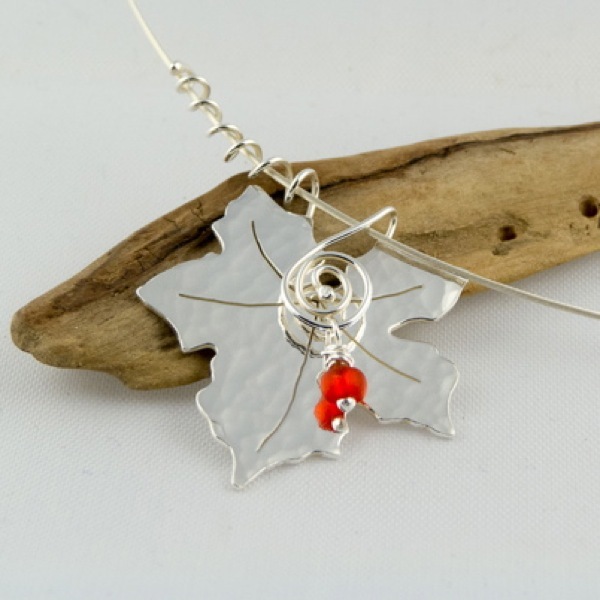 Both feature a single leaf, one in silver and the other in brass, and both make use of twisting silver tendrils to suspend the pendant from a silver necklet. The silver version with the red glass berry (which can be removed) has already found a new home, but the brass version is available in my Etsy shop now. Your necklaces are stunning! I too love the Flower Fairies and have a book with all of them in, plus an address and birthday book…. will definitely head to their site. Thanks!